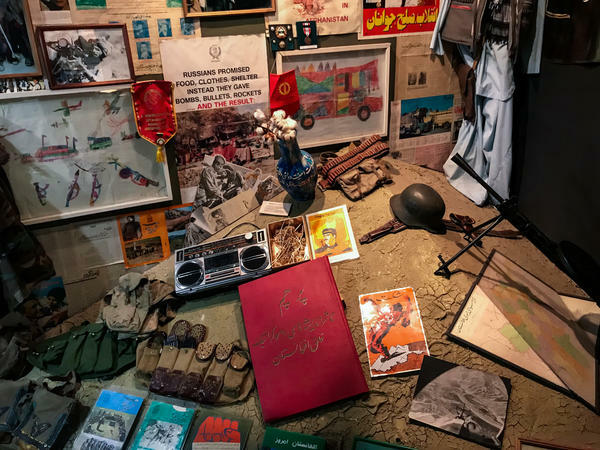 A small museum dedicated to the Afghan war is tucked into the ground floor of a nondescript building on the eastern outskirts of Moscow. The passage of time has dulled the sting of the Soviets' 1989 withdrawal from Afghanistan. In 1982, Igor Yerin was working in a Moscow car plant when he was drafted into the Soviet army at age 20 and sent to Afghanistan to fight U.S.-backed guerrillas known as the mujahedeen. He ended up serving as a platoon sergeant with the 149th Motorized Rifle Regiment based in the northern city of Kunduz. Three years earlier, the Soviet Union had invaded Afghanistan to prop up a friendly regime. But the war against the mujahedeen turned into an unwinnable quagmire, and on Feb. 15, 1989, the last Soviet soldiers came limping out of Afghanistan — an omen of the Soviet Union's dissolution less than three years later. "First of all, we were following orders," Yerin said in an interview with NPR. "And secondly, the motherland sent us — we wouldn't have gone on our own." Yerin is now the director of a small museum dedicated to the Afghan war, tucked into the ground floor of a nondescript brick apartment building on the eastern outskirts of Moscow. Its halls are filled with carefully selected artifacts of the time: high school graduation photos, maps and medals, a Toshiba boombox, a pair of combat boots, and a child's drawing of the machines of war. Igor Yerin, the director of a museum dedicated to the Afghan war outside Moscow, served as a Soviet Army platoon sergeant in northern Afghanistan. The Soviet war in Afghanistan lasted more than nine years. It was a cauldron that took the lives of 15,000 Soviet soldiers and hundreds of thousands of Afghan civilians, and turned millions of Afghans into refugees. Yet the Soviet Union's withdrawal did not bring peace. Rival warlords vying for power plunged Afghanistan into a civil war until the radical Taliban movement imposed its ruthless form of Islamic order, taking over most of the country by 1996 while continuing to fight the opposition Northern Alliance. When the Taliban refused to surrender al-Qaida leader Osama bin Laden after the Sept. 11, 2001, terrorist attacks, the United States went to war against the Taliban — and is still fighting them. 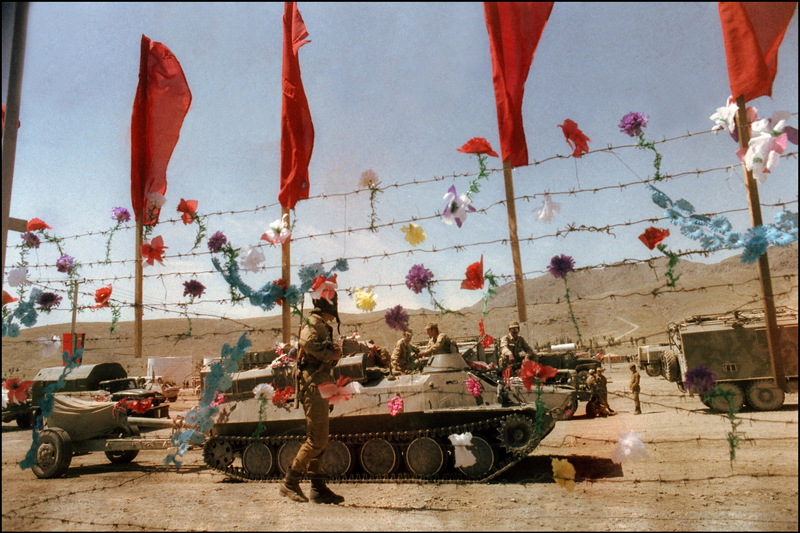 Artificial flowers decorate barbed wire fence as Soviet army troops stop in Kabul, Afghanistan, in May 1988. The Soviet Union invaded Afghanistan in December 1979 to shore up the pro-Soviet regime in Kabul. Although there may be parallels with the U.S. campaign in Afghanistan, the Soviet invasion is more comparable to the Vietnam War: a modern military with armor and airplanes beaten back by determined guerrilla fighters in sandals. The humiliation of Moscow's 1989 exit from Afghanistan was compounded by the collapse of the Communist system and the subsequent withdrawal of Soviet forces from Eastern Europe. The Russia that emerged from the Soviet Union was in retreat. Moscow waged two brutal campaigns against Chechen rebels in the name of preserving the country's territorial integrity. But Russian troops didn't see foreign action until the five-day war with Georgia in 2008, a prelude to even bigger military interventions in Ukraine and Syria. 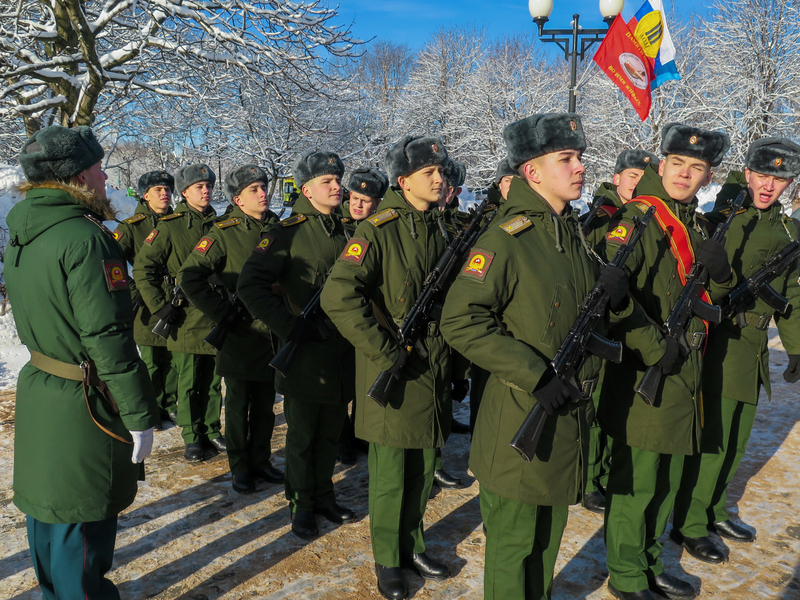 Under President Vladimir Putin, the Kremlin has been modernizing the Russian armed forces and has turned the Soviet Union's victory in World War II into an annual celebration of the country's military glory. "Now the situation is changing dramatically in regards to the deployment of troops to Afghanistan, and those who fought are being looked up to again," said veteran Sergei Morozov. "Life has shown that it most likely wasn't a mistake." Military personnel stand at attention during a ceremony in a Moscow park dedicated to the 1989 Soviet withdrawal from Afghanistan. The war cost the lives of 15,000 Soviet soldiers and hundreds of thousands of Afghan civilians. Morozov, who served as a paratrooper, was attending a ceremony marking the Soviet withdrawal, in Afghan Square, a neighborhood park not far from Yerin's museum. At the center of the square is a stark sculpture depicting three grieving mothers with bowed heads. Behind it stands a wall of black stone etched with the names of hundreds of Muscovites who fell in Afghanistan. On Feb. 14, a procession led by a military band made its way through the snow-covered park to the monument. There were burly veterans, middle-aged women and children in the tan uniforms and red berets of the Young Army patriotic movement. Some held black-and-white photographs of soldiers killed in Afghanistan. "The war touched everyone," said Marina Tishnikova, bundled up in a fur coat. "I feel sorry for those boys, look at how many photos there are. A lot of mothers were left alone and still can't get over it." Two armored personnel carriers flanked the sculpture with red banners, one reading: "We fulfilled our military duty with honor" and the other: "Glory to the soldiers of the fatherland! Glory to the sons of the motherland!" After speeches by local politicians, the crowd laid flowers at the memorial. Then a Russian Orthodox priest led the procession into a field to bless the cornerstone of a new church dedicated to the veterans of Afghanistan. 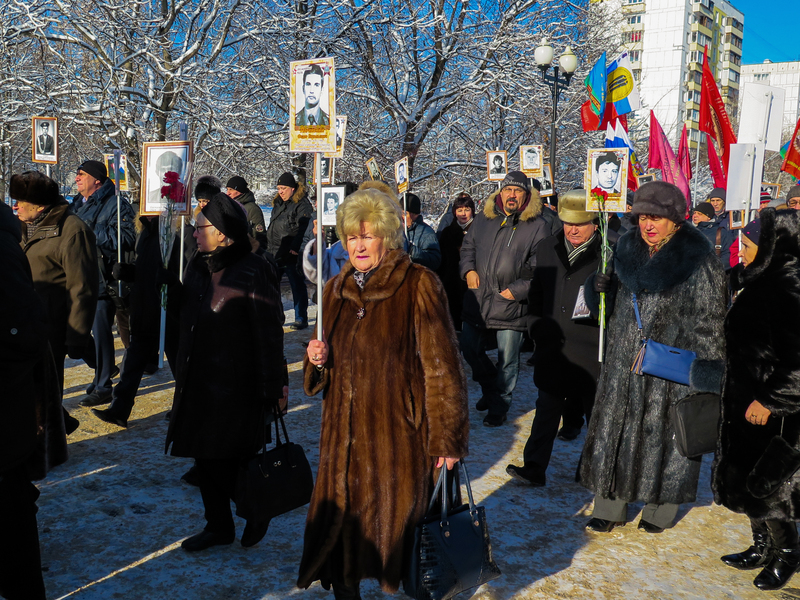 Muscovites carry the portraits of young Soviet soldiers who fell in Afghanistan. The Soviets withdrew from the country 30 years ago. "It wasn't a war, it was a military action," said veteran Sladislav Matviyenko. "If two mujahedeen shoot at you, that's not a war, it's a terrorist act. Our Soviet troops went there to help by the request of the legal Afghan government." The passage of time has dulled the sting of the withdrawal, as veterans of the war join the ranks of all those who served the motherland. If the sculpture of mourning mothers on Afghan Square reflected the public mood in the early 1990s, then the monument of a fully armed Soviet soldier in Moscow's Victory Park is emblematic of resurgent national pride under Putin. That statue was dedicated in 2004, on the 25th anniversary of the Soviet invasion, and is called "monument to the internationalist soldier," using a Communist-era euphemism. Still, the memory of a disastrous and unpopular war has guided Putin's foreign military interventions. The Georgian war lasted less than a week and had a clear objective: the occupation of two rebel regions that were already sympathetic to Russia. In Ukraine, Russian troops without insignia were deployed in covert operations. And in Syria, Russia's involvement in support of Bashar Assad's regime has been limited to an air campaign, while riskier ground missions are carried out by private military contractors with no official status. Another consequence of the Afghan war is a lingering suspicion that the United States is ready to support Muslim extremists to undermine Russia. Russian officials have repeatedly accused the United States of backing Islamist militants in Chechnya and ISIS in Syria. 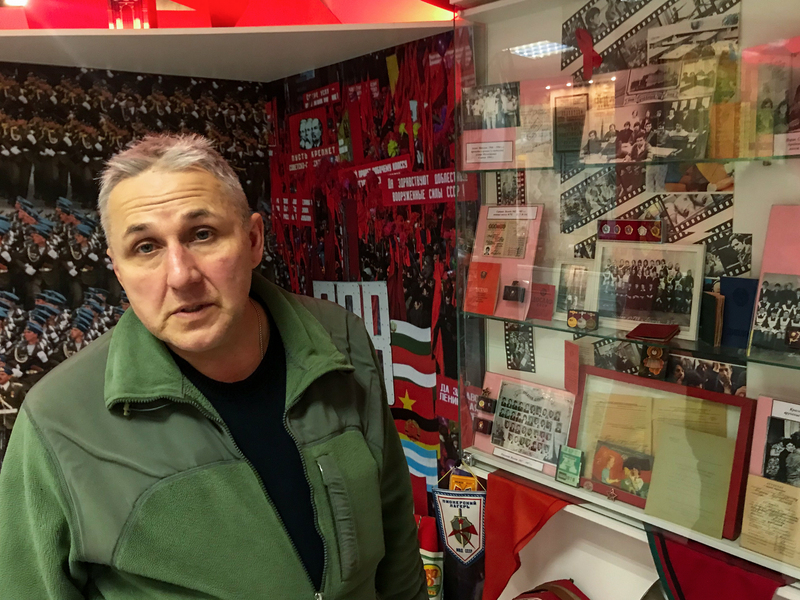 As he gave a tour through his museum, veteran Yerin said he has no regrets on the 30th anniversary of the Soviet withdrawal. He said he feels proud of himself and the country he fought for — even if it doesn't exist anymore. "We trained teachers and doctors and soldiers," Yerin said. "Of course there was a political element to it, but we even sent an Afghan into space in 1988." Like many veterans, Yerin is bitter about the role the United States played during the war, supplying the mujahedeen with weapons and money. "When we were 20 years old, they told us it was possible the Americans would try to lay a hand on Afghanistan, and we laughed," said Yerin. "Now everything is happening just as they told us 40 years ago." The U.S. war in Afghanistan has lasted almost twice as long as the Soviet one. 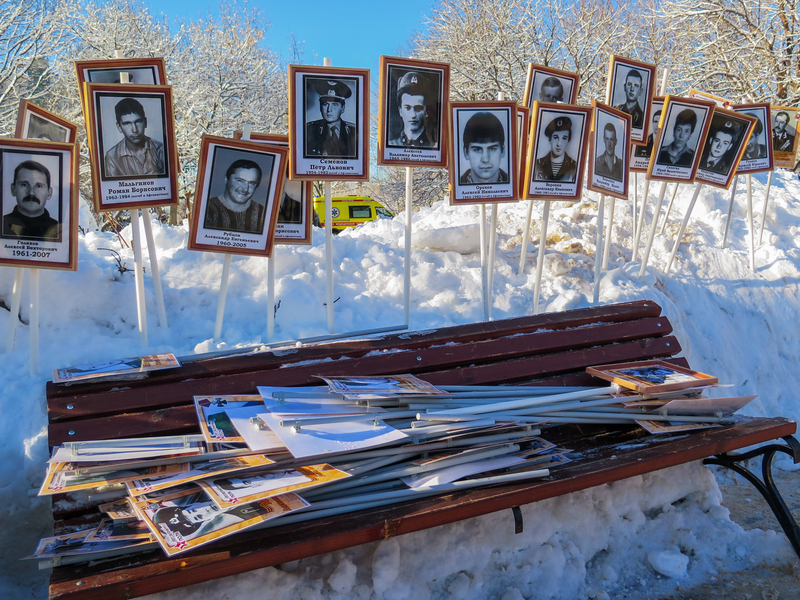 Photos of soldiers who served in Afghanistan are stacked up in a Moscow park after a ceremony marking the 30th anniversary of the Soviet Army's withdrawal. The memory of the disastrous and unpopular war has guided recent Russian military interventions.